We’ve just completed a major, in depth survey among 1,000 residents of Alberta. The second tranche of results is described here, and more of the data will be available in the coming weeks. Our first release, from earlier this week, can be found by clicking here. We offered respondents a series of choices and asked them to pick which of the options best accounts for what happened in the election that resulted in an historic shift in the political landscape. – The vast majority (91%) said the result had nothing to do with preferring a female Premier. Only 9% overall and only 10% among women, said it was about electing a woman. – Overwhelmingly, those surveyed say the result was more about a desire for change (93%) rather than a preference for the NDP (7%). NDP voters were as likely as everyone else to say it was more about change. 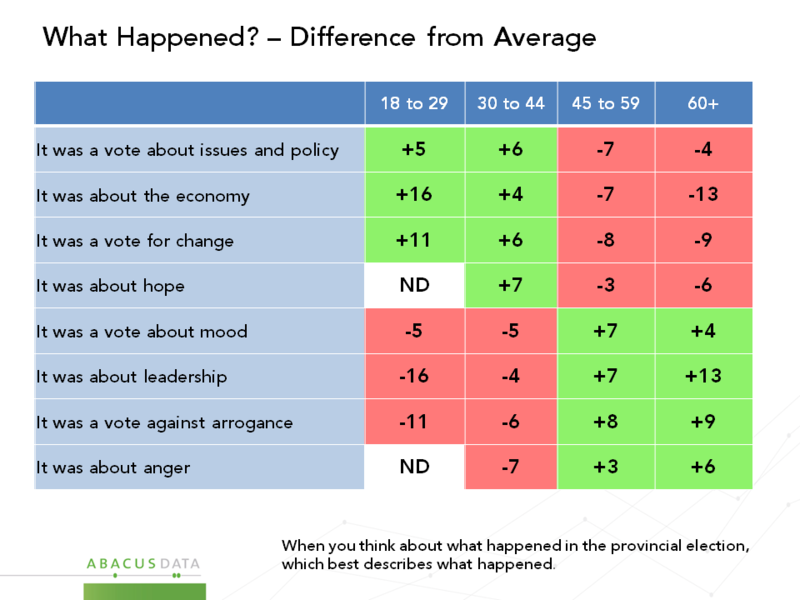 Interestingly, those aged 18 to 29 were more likely to say the election was about people liking the NDP, as opposed to people wanting change. – Two thirds (67%) say the leaders’ debate mattered; only 34% felt it was not that important. To underscore just how critical it was, those who voted NDP voters were 9 points more likely to say the debate mattered. – More felt the result was about “cooling on Jim Prentice” (63%), than “warming to Rachel Notley” (37%). 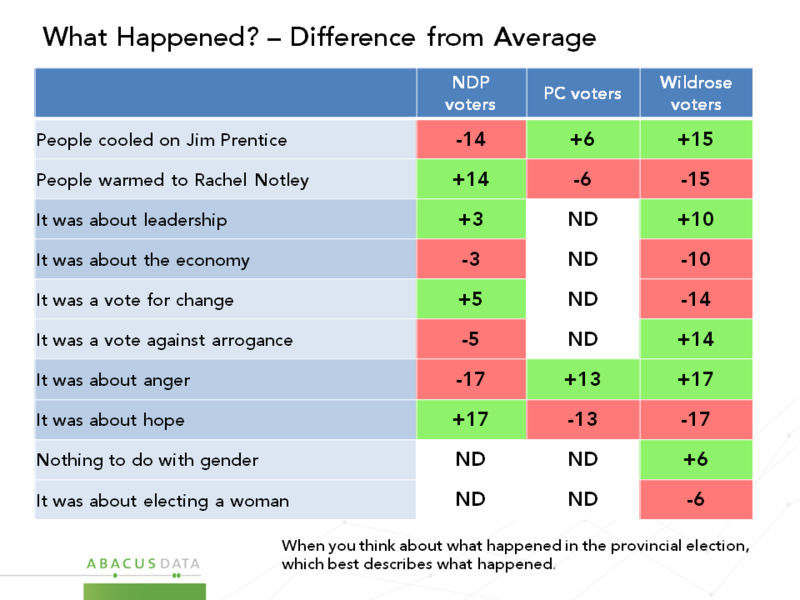 NDP voters were 14 points more likely to say it was about warming to Rachel Notley, while Wildrose voters were 14 points more likely to say it was about cooling towards Jim Prentice. – More say this election was about anger (62%) than about “hope” (38%). 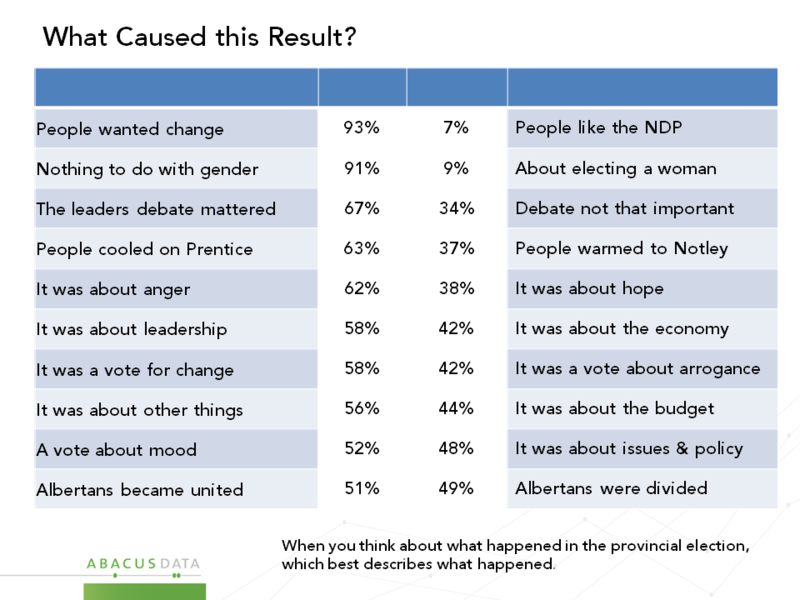 Wildrose voters were more likely than others to say it was about anger, while NDP voters were more likely to say it was about hope. – Most say the election had more to do with leadership (58%) than the economy (42%). Given the economic pressures faced by Alberta in recent months, this is well worth noting. Of note, those under 45 years of age were more likely to say the election was about the economy while those over 45 were more likely to think the election was about leadership. – The provincial budget was a prominent backdrop for the election call, and almost half (44%) said the result was about the budget. More (56%) said the election was about other things. – The election was almost equally seen as an expression of “mood” (52%) as it was a choice made around “issues and policy” (48%). 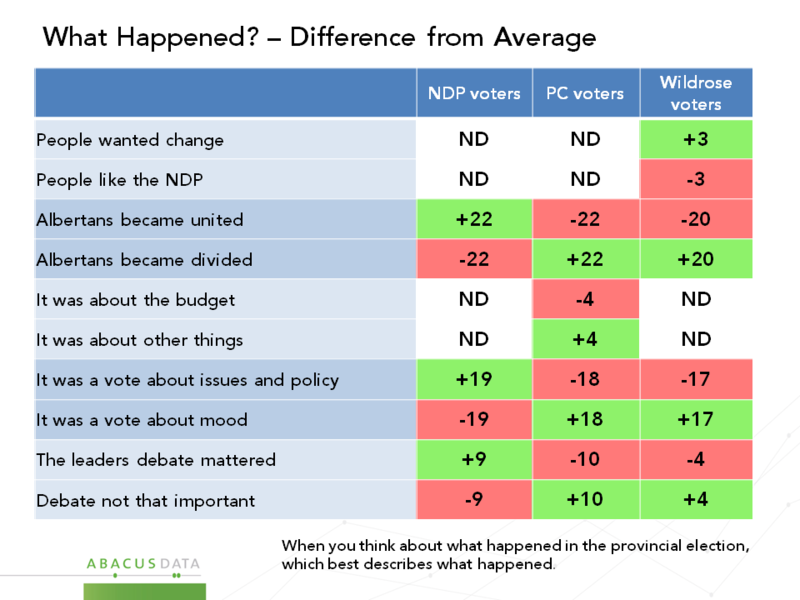 NDP supporters were far more inclined to see it as a issues based result, while PC and Wildrose voters said it was about mood. – Finally, Albertans are equally divided on whether the result was about the province becoming united (51%) or being divided (49%). Perhaps, given the nature of the result, what is most remarkable is that so many people saw the result as having a unifying element or at least being about a shared feeling. – Young people were more likely to say it was a vote about issues, older people more likely to say it was about mood. – Young people were more likely to say it was about the economy, while older people were more likely to say it was about leadership. – Older people were more likely to say it was a vote about anger and a reaction to arrogance, while younger people were more likely to say it was about hope and change. This election is one of the most fascinating ones to have happened in Canada in recent times. These results indicate it was less about the economy than one might have expected, and while it resulted in the election of a female Premier, gender per se did not appear to play a big role in the outcome. It was a “change from something” rather than a “change to something” election, and also more about the qualities people were looking for in a leader than specific policy ideas. Those who voted NDP clearly warmed to Rachel Notley, while many others who left the PC’s for the Wildrose were expressing disappointment in Jim Prentice. While there was a fair bit of anger, there was also a considerable measure of hope. Inasmuch as 60% didn’t vote NDP but only 25% are unhappy with the outcome, this challenges any notion that Alberta is today a place where partisanship and ideology are deeply rooted: most seem quite open to trying a different approach. Clearly, WRP and NDP voters had different priorities, but for most voters, if not for the most partisan of voters, these seem to be differences of degree more than fundamental direction. Our survey was conducted online with 1,000 Alberta residents aged 18 and over from May 6 to 11, 2015. A random sample of panelists was invited to complete the survey from a large representative panel of Albertans, recruited and managed by Research Now, one of the world’s leading provider of online research samples. The Marketing Research and Intelligence Association policy limits statements about margins of sampling error for most online surveys. The margin of error for a comparable probability-based random sample of the same size is +/- 3.1%, 19 times out of 20. 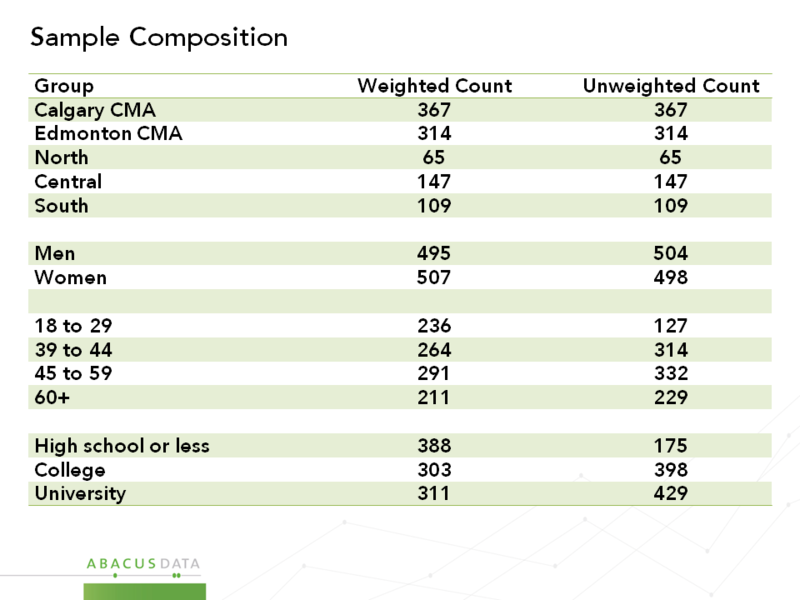 The data were weighted according to census data to ensure that the sample matched Alberta’s population according to age, gender, educational attainment, and region of the province. Totals may not add up to 100 due to rounding. We offer global research capacity with a strong focus on customer service, attention to detail and value added insight. Our team combines the experience of our Chairman Bruce Anderson, one of Canada’s leading research executives for two decades, with the energy, creativity and research expertise of CEO David Coletto, PhD.